Like their wild counterparts, captive reptiles readily use branches, logs and bark sections for climbing and hiding. You can buy wood from pet stores that's suited for pet habitats and ready to use, or you can collect wood for a terrarium yourself. However, any wood you collect is likely to carry bugs and bacteria, so you must take steps to prepare the wood before adding it to your pet's cage. Many keepers find real branches to be more aesthetically pleasing than plastic or glass perches. 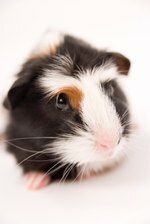 You must avoid placing toxic woods into your pet's cage. Many hardwood species, including oaks (Quercus sp. ), dogwoods (Cornus sp.) and maples (Acer sp.) are safe and work well in a reptile habitat. Few conifers are appropriate, and you should avoid wood from pine (Pinus sp. ), cedar (Juniperus sp.) or eucalyptus (Eucalyptus sp.) trees because of the aromatic compounds the wood releases. Knock the wood on the ground a few times to dislodge as much dirt and loose bark as possible. To remove the dirt that remains, use a stiff-bristle steel brush and plenty of water. Clean the wood outdoors, but use hot water if possible. If you must cut the wood to size, do so after you have washed it. Now that the wood is free of surface dirt and debris, make sure it is not harboring insects, arthropods, bacteria, viruses or fungi. Because wood is porous, it is best to avoid using harsh chemicals or disinfectants to sterilize it. Instead, use heat to kill any microbes present. The easiest way to treat the wood is with a handheld steam-generating unit, but you can also boil or bake wood. Baking is the easiest strategy, but it is not applicable for large pieces of wood. Bake branches or logs in an oven set at 250 to 300 degrees Fahrenheit for about 30 to 60 minutes. Never leave wood unattended in an oven, as it is a fire hazard. Boiling water is only about 212 degrees Fahrenheit, so you must boil wood for six hours or more to ensure it is free of microorganisms. Damp wood will decompose more quickly than dry wood will. If you have boiled or steamed the wood to sterilize it, you should let it dry for several days before placing it in the tank. Place the wood in a clean, dry space; you do not want to place it outside on the ground where it can be recolonized by pests and pathogens. The larger the piece of wood, the longer it will take to dry -- very large pieces will take days or weeks to dry completely. If you prefer, you can dry wood in an oven set to 200 degrees Fahrenheit for several hours.